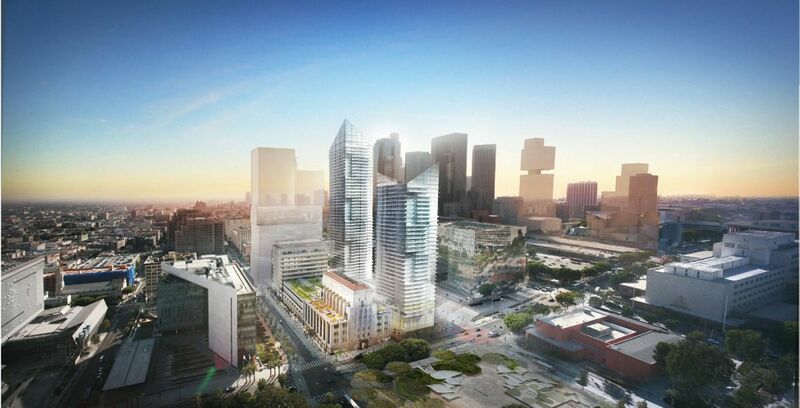 Los Angeles-based architects AC Martin and Canadian developer Onni Group have released preliminary renderings for the long-rumored, 1,126-unit Times Mirror Square development that aims to replace the 1970s-era William Pereira addition to the Los Angeles Times building in Downtown Los Angeles. 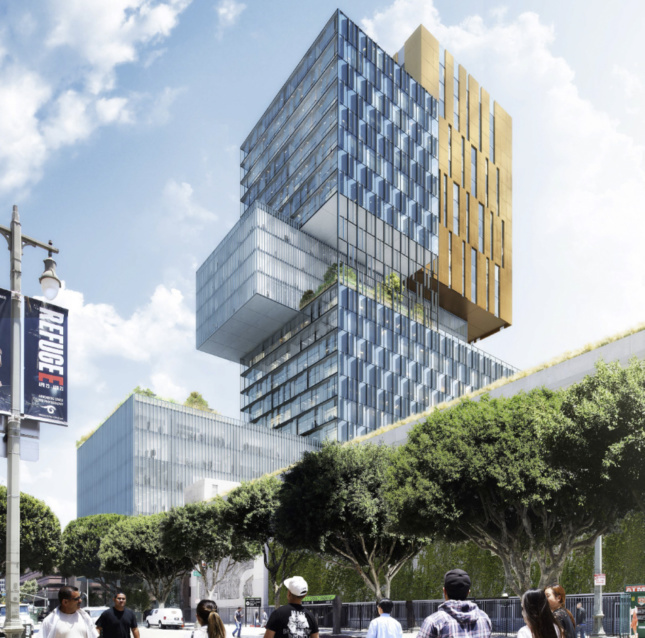 The project, part of a larger, overall redevelopment of the L.A. Times headquarters complex that also includes a new, 30-story tall tower by Gensler, would connect to the existing L.A. Times building via ground floor retail spaces and an outdoor, retail-lined paseo. 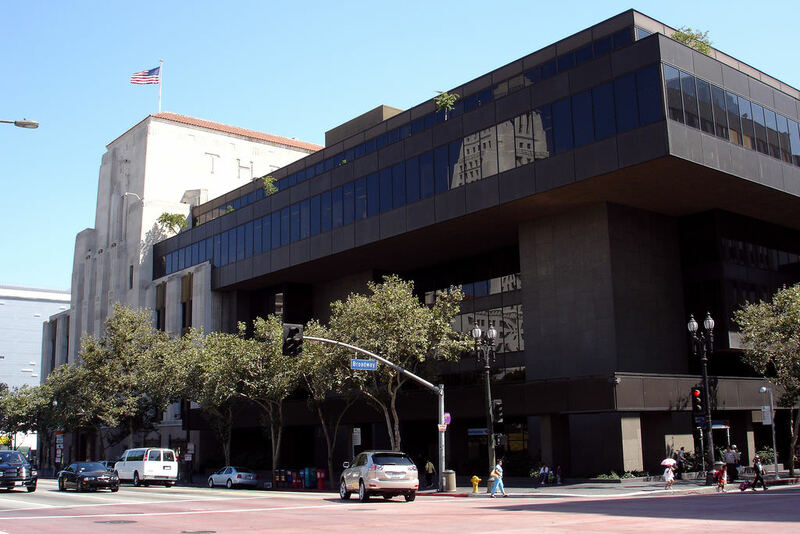 The original 1940s-era, art deco style L.A. Times headquarters is expected to receive modest restorations via the project while the iconic, late modern era Pereira-designed structure will be completely demolished to make way for the development. The Pereira structure is just four years shy of being eligible for the National Register of Historic Places and is not listed as a local Historic-Cultural Monument. Urbanize LA reports that AC Martin would bring a pair of high-rise residential towers to a neighborhood soon-to-be-brimming with open space amenities like the forthcoming revamp to Pershing Square park by Agence Ter, First and Broadway (FaB) park by Mia Lehrer and Associates and OMA, and the five year old Grand Park by Rios Clementi Hale Studios. A 37-story tower would be located directly across the street from Lehrer’s FaB Park, with a taller, 53-story monolith located directly behind. Both towers are capped by pointy, crenelated caps and will reportedly rise 465- and 655-feet in height, respectively. The towers will contain parking stalls for 1,000 vehicles despite being located almost directly atop a forthcoming transit stop on the city’s Regional Connector line.